Solana Beach CA (Aug 11)--The odds of Deborah Ellen Frisch remaining free on bond until her sentencing October 2nd dropped sharply today, as Miss Debbie continued her 24 hour email-tantrum, CCing her spittle-flecked missives to various law enforcement and criminal justice officials. Miss Debbie's lawyer decided he'd had enough: "What the hell are you doing...ccing [Weld County DA] Ryan Chun?" sputtered Debbie's (soon-to-be-ex) attorney. "I fully expect he seeks a warrant. I can't save you from yourself anymore." 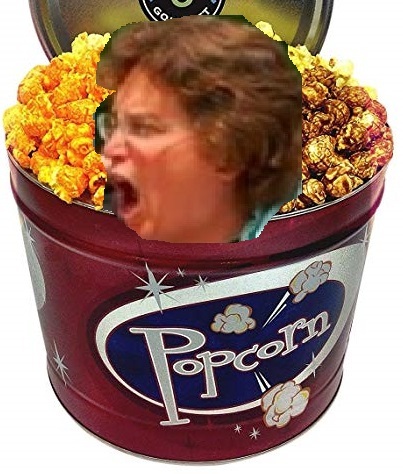 One of those CC'd in Debbie's email-tantrum, blogger RS McCain, took the capitalist's opportunity and offered refreshments: "Say, does anyone want to order some gourmet popcorn? Because this is highly entertaining as a spectator." As of 10:45am PST, this story is still (dare we say?) still popping!